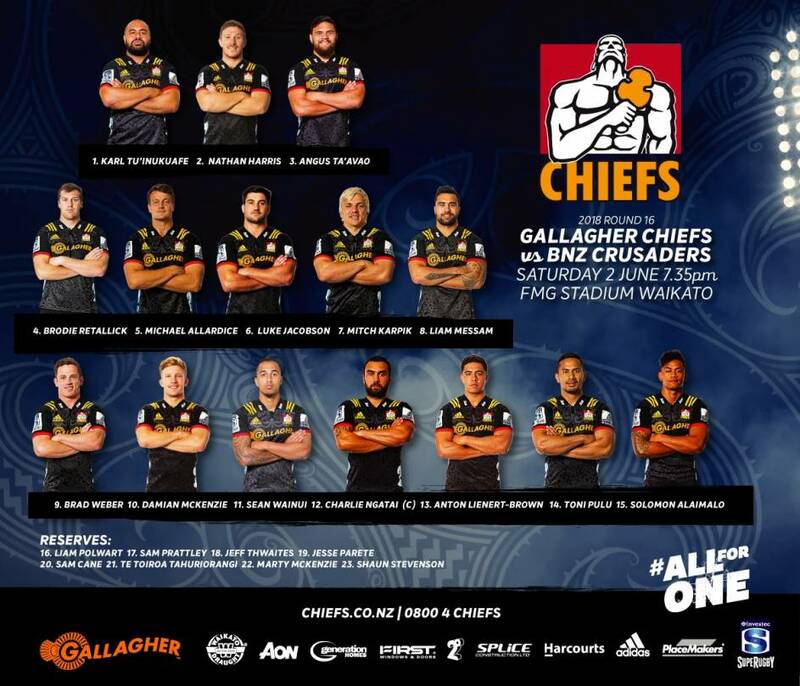 The Gallagher Chiefs are braced for a huge derby this Saturday in Hamilton against southern rivals the BNZ Crusaders. The 2017 champions return to FMG Stadium Waikato for the first time since 2015 with excitement peaking for this game. Last time the sides met at FMG Stadium Waikato, the Gallagher Chiefs put in a clinical performance to run out 40-16 winners. Colin Cooper has named an unchanged starting side from the one which beat the Waratahs last Saturday, with key figure Sam Cane returning from injury to the number 20 jersey. Angus Ta’avao and Karl Tu’inukuafe continue in the front row with Nathan Harris. Brodie Retallick and Michael Allardice start in the number four and five jerseys, and Luke Jacobson, Mitchell Karpik and Liam Messam make up the loose forward trio. Notably in the backs, Charlie Ngatai will start in the midfield again with Anton Lienert-Brown, after a fantastic performance last weekend. Cooper is aware of the Crusaders’ threat at the set piece and is emphasising discipline for the team’s success this Saturday. He was also thrilled with the attacking tenacity the team showed against the Waratahs. The game will be the last before the Investec Super Rugby June break, with the competition commencing back again at the beginning of July. The next home game for the Gallagher Chiefs will be against the Brumbies - an early kick off of 5.15pm on Saturday 7 July at FMG Stadium Waikato. The match this Queens Birthday Saturday kicks off at 7:35pm at FMG Stadium Waikato. You can get your tickets at ticketdirect.co.nz now!